The Crimson will try to preserve a 78-year-old streak in its Friday battle with the Bulldogs before clashing with the Bears the following night. No matter where the mutually respected rivals sit in the standings, Harvard and Yale always skate to a competitive contest. 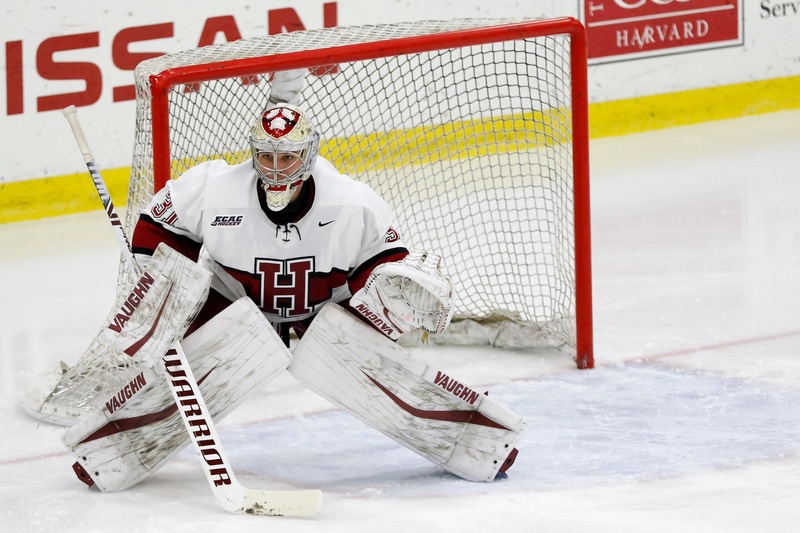 The last time the Harvard men’s hockey team remained winless through its first four regular-season games, not a single member of the current roster was alive. In fact, neither was coach Ted Donato ’91. That’s because the last time the Crimson skated through its opening four contests without a victory, some members of the Harvard student body were fighting in World War II. The year was 1940, and it stands as the only instance of a winless Crimson team through four games in the 121-year-old documented history of the Harvard hockey program. This weekend, the Crimson (0-2-1, 0-2-1 ECAC), still in search of its first triumph of the campaign, hopes to keep this staggering streak intact when it trips down to New Haven, Conn., to visit none other than storied Ivy League rival Yale (2-1-0, 2-1-0). Unlike their Cambridge counterparts, the Bulldogs enter the Friday tilt with multiple ticks in the win column, having defeated Brown to open the season before splitting last weekend’s series with Upstate New York travel partners, then-No. 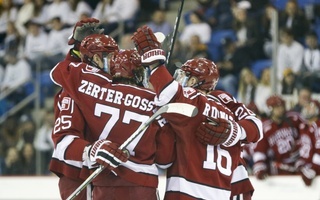 18 Cornell (loss) and Colgate (win). The intensity of a Harvard-Yale bout, however, scarcely depends on the teams’ records coming into the game. 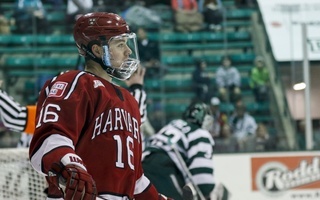 Now-sophomore Kevin O'Neil potted both goals, including the late-game go-ahead score, in Harvard's most recent meeting with Yale last February. In addition to potentially earning its first win of the year, the Crimson has an opportunity to avenge a season sweep at the hands of the Bulldogs in 2017-2018. 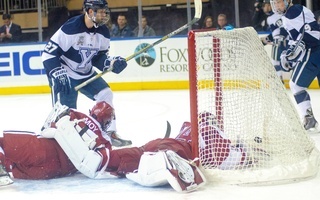 In two clashes that more or less bookended last regular season, Yale held Harvard to just three combined goals. 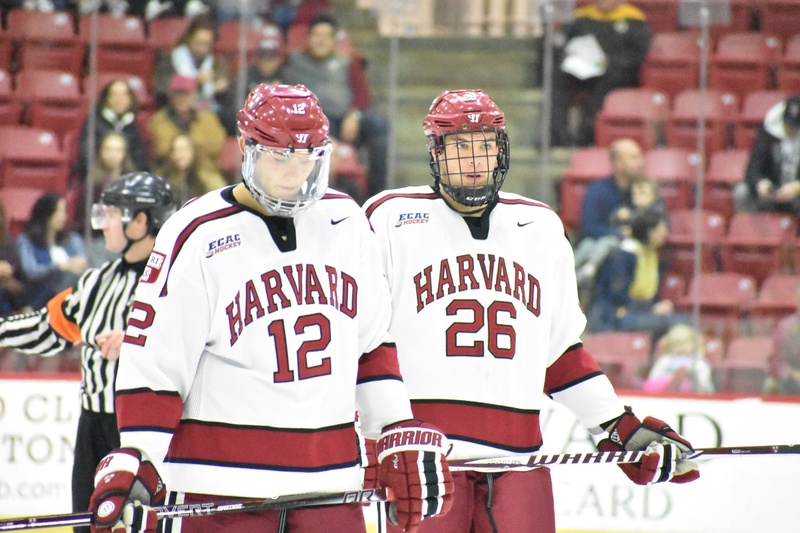 In early November, the visiting Bulldogs handed the Crimson its first home loss in over a year, and in late-February, a pair of goals by then-freshman Kevin O’Neil soured the end of Harvard’s regular season. Not dwelling on the recent past, the Crimson enters the weekend with a fresh-start mindset. The Crimson is still searching for consistency in the opening stage of the campaign. Coach Donato has experimented with numerous line combinations and multiple starting goaltenders through three games, as the group works to improve its team defense and play a more complete, 60-minute game. Freshmen like blue-liner Jack Rathbone are carrying much of the scoring load for the Crimson early on this season. 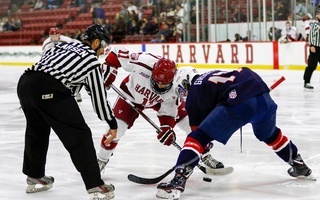 Early on, Harvard has received significant offensive contributions from its freshmen, such as blue-liner Jack Rathbone (2–4—6) and forwards Jack Drury (1–4—5), Casey Dornbach (1–3—4), and Baker Shore (1–1—2). With these four first-years assuming critical roles in the lineup right away, the freshman class has accounted for 44 percent of the team’s total scoring through three games. Junior defenseman Adam Fox, a Preseason All-ECAC selection, is setting the Crimson’s overall scoring pace with eight points (1–7—8). The Jericho, N.Y., native is the facilitator on college hockey’s second-best powerplay (.429) in the early part of the season and deservedly draws attention from every opponent. Despite his offensive prowess, Fox’s primary role is to keep other teams’ forwards in check. On Friday against Yale, he and his fellow Harvard rearguards will have their hands full with Bulldogs senior Joe Snively. 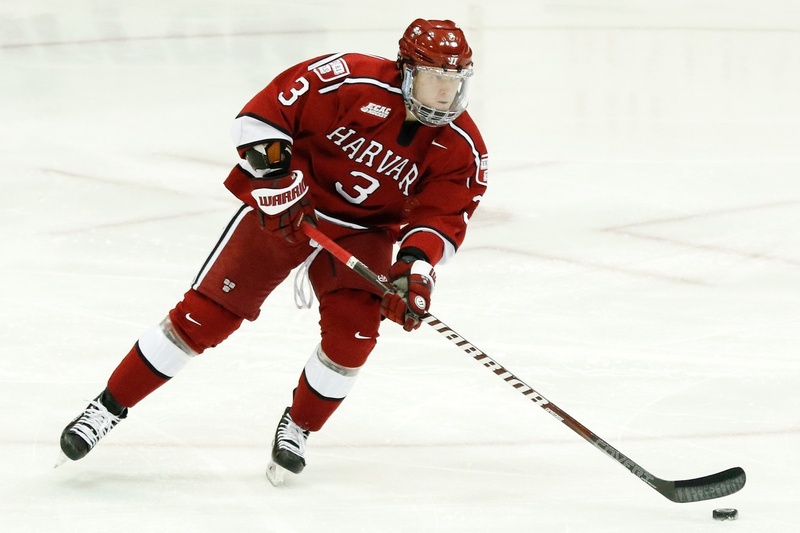 Snively, also named to the Preseason All-ECAC team, has logged seven points (3–4—7) through three contests and has done significant damage to the Crimson in the past, putting up 10 points (4–6—10) in eight career appearances against Harvard. 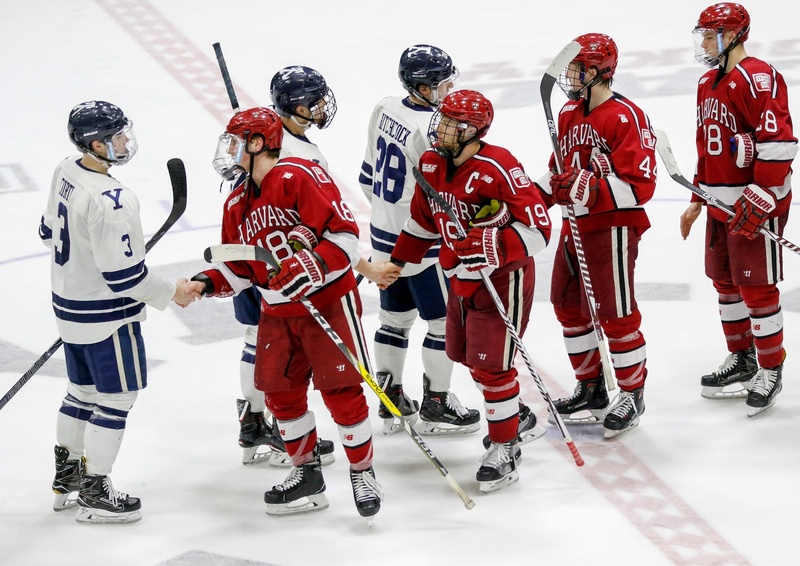 If the Crimson wants to achieve its usual slate of goals — a Beanpot title, ECAC championship, and NCAA Tournament berth — it will have to improve its team defense. Skating alongside the Herndon, Va., product are freshman center Curtis Hall (1–4—5) and O’Neil (2–1—3). The trio comprises Yale’s most potent line offensively, combining for 68 percent of the team’s scoring through its first two weekends. In net, coach Donato will likely turn back to Lackey (0-1-1, 5.30 GAA, .780 SV%), who received the starting nod last Saturday in a 4-4 draw with Princeton after junior Cameron Gornet (0-1-0, 5.27, .833) manned the pipes the previous night against Quinnipiac. As of Tuesday, however, Lackey had not received any official indication of his role in the upcoming Ancient Eight tilts. As the numbers of both backstops indicate, the Crimson has been porous on defense in its first three games. Until the copious goals against subside, the starting goaltender role is for the taking. For the Bulldogs, the battle for the blue paint is no less intense. 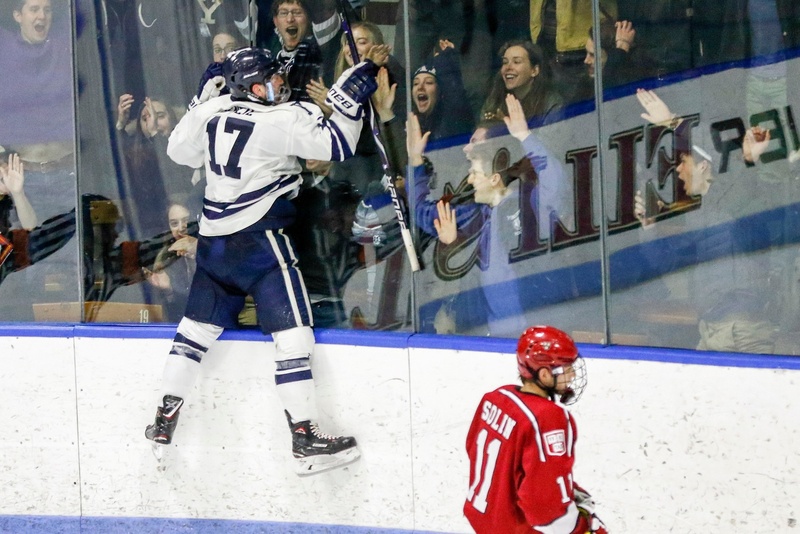 Junior Corbin Kaczperski (1-1-0, 2.53, .900) has fielded pucks in two of Yale’s three games at the outset of the campaign after earning roughly half the starts in the 2018 portion of last season. Senior Sam Tucker (1-0-0, 2.00, .931), who began last campaign as the Bulldogs’ number-one, has started just once this season but posted sturdier numbers in that effort. “From the moment you commit to a school like this…it’s one of the games you definitely circle on your calendar in terms of the atmosphere and the building, so it’ll be really cool,” said Rathbone ahead of Friday’s bout with Yale. Whether the Crimson snaps a 78-year streak on Friday or not, it will head to Providence, R.I., for a matchup with Brown (0-3-1, 0-2-1) the following evening. While the ambiance in Meehan Auditorium will be predictably more subdued than the rivalry-fueled energy at “The Whale,” an equivalent two standings points are on the line. Senior net-minder Michael Lackey looks to stave off junior Cameron Gornet from taking the starting job. But this will require a sturdy performance on the weekend. Plus, in 2017-2018 Harvard learned the hard way not to underestimate any opponent. Despite the Bears consistently being an ECAC bottom-feeder in recent years, Brown stunned an unsuspecting Crimson team last February, commencing an end-of-season rut for coach Donato’s group that extended into the first game of conference tournament play. Much like Harvard, the Bears have benefitted from the play of their rookies early on this season. Three freshmen forwards lead the way in scoring: Justin Jallen (2–2—4), Tristan Crozier (2–1—3), and Jake Harris (1–2—3). While Brown tied a struggling Colgate team last weekend, it also played Cornell to a close one-goal game, albeit a losing effort for the Bears. So the Crimson will not be taking its nearby ECAC opponent lightly. As strange as it sounds, few things in college hockey are as certain as the uncertainty in the ECAC, as the conference schedule is annually rampant with parity. On Friday night, this trend will only heighten the intensity and unpredictability of a classic Harvard-Yale clash. On Saturday, it will raise the stakes for the Crimson, as recent history has taught the squad that no two standings points ever come easily.